With the 2010-11 season over a quarter of the way through, some distinctive trends are emerging in the NHL. Carey Price has been a nearly unstoppable force for the Canadiens, Tim Thomas has rendered Tuukka Rask irrelevant in Boston, and Steven Stamkos has continued his development into one of the league’s elite forwards. This season has also seen the continued success of one of the league’s most maligned franchises. The Phoenix Coyotes, the Cinderella team that finished fourth in the West last season, have continued to play well after a sluggish start to the season. After defeating the Edmonton Oilers on Tuesday night, the Coyotes have run their winning streak up to seven games in a row, and are currently in first place in the Pacific Division. Looking at the numbers and at the make-up of this Coyotes team, there are some legitimate questions as to whether or not they will be able to sustain their current performance. These questions will be answered over the next 61 games, but there are five specific queries that will need to be answered by this team as they move forward through their schedule. 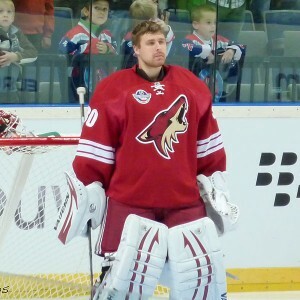 Question #1: Will Ilya Bryzgalov be able to keep this defense out of trouble? Last season Bryzgalov had a career year, notching a 42-20-6 record and a stellar 2.29 GAA. He was arguably the biggest reason that the team made the post-season, and he shed some of the criticism that has dogged him throughout his career about his inconsistency. After an off-season that saw the Coyotes lose defenseman Zbynek Michalek to free agency, the team has looked far worse on defense. The blue line corps held opponents to 29.6 shots on goal a game last season, but that number has jumped by over five shots this season, and that ranks them 28th in the league. Their penalty killing has also gone from the league’s sixth best last year (84.5%) to the league’s seventh worst this season (78.7%). These numbers are positively atrocious, and it shows how much additional pressure Bryzgalov is under in the early going for Phoenix. The Coyotes called up defenseman Oliver Ekman-Larsson from San Antonio to bolster the blue line a bit, but the fact remains that the team has to allow fewer pucks to get at Bryzgalov. Even if Ilya plays at a comparable level to last year, he’s going to allow more goals simply because of the volume of shots he is facing. Question #2: Can the improving offense stay productive? The big knock on the Coyotes last season was their lack of offensive punch. Their top scorer Shane Doan had 55 points, and the only other player that cracked the half-century mark is no longer on the team (Matthew Lombardi). In fact, things were so bad for their offense that Scottie Upshall finished third on the team with 18 goals while missing 33 games with a knee injury. Needless to say, there was nowhere for this offense to go but up this season. The team added veteran forwards Eric Belanger and Ray Whitney to the mix to help boost scoring, but they were unable to land any bigger free agents to really add punch to the top six group. Even with the additions not being of a monumental nature, the team is still faring better offensively. They have gone from 24th in the league to 18th in goals per game (now scoring at a 2.8 per game clip), and their power play is ranked 17th on the season as opposed to 28th a year ago. Question #3: If Matthew Hulsizer is the new owner, will he shell out money to help bolster the roster for a playoff run? The biggest hurdle facing the Coyotes at last year’s trade deadline was that they weren’t given much flexibility by the NHL to pursue moves to improve the roster. They still managed to make some solid acquisitions, bringing in Derek Morris, Mathieu Schneider, Wojtek Wolski, and Lee Stempniak to bolster the squad. Stempniak and Wolski both played really well on offense, with Lee notching 14 goals in 18 games and Wolski picking up 18 points during that time. By the time this season’s trade deadline rolls around, the Coyotes should have new ownership in place, and the team’s precarious financial situation may finally come to an end. Matthew Hulsizer, founder of Peak6 Investments, is nearing completion of his purchase of the Coyotes, and he has already expressed a willingness to go against the status quo. “The truth is, I probably care more about winning than I do about money”, Hulsizer told the Arizona Republic earlier this year. This quote can be construed in several different ways, but the main thrust of it is the idea that Hulsizer is willing to put money into the team in order to put a winning product on the ice. Hulsizer seems to be a proponent of the belief that a winning product on the ice will lead to financial success off of it. Due to the wild successes he has had in the business world, it almost goes without saying that Hulsizer seems to know what he is doing. Fans can more than likely look forward to some nice pick-ups at the trade deadline this year, and the team will benefit from this new attitude in the front office. Question #4: Will Kyle Turris start to unlock his potential and be a key cog in the team’s fortunes this season? Turris came into the NHL after the 2007 Entry Draft, the third overall selection by the Coyotes. Being picked behind Patrick Kane and James van Riemsdyk certainly comes with its own set of expectations, but the fact that he was the number one rated player by NHL Central Scouting heading into that draft put him into another stratosphere all together. His NHL career has been up and down to say the least. In his 81 career games, he has scored 12 goals and dished out 15 assists. He has spent parts of all four of his professional years in the AHL, including all of last year. Unfortunately for Turris, he was injured in Friday’s game against the Edmonton Oilers, and was placed on injured reserve with an upper body injury on Tuesday. He is listed as week-to-week by the team, so his quest to earn his permanent place on the NHL roster will have to wait until he is healthy again. Question #5: Will Dave Tippett’s disciplined style continue to get the most out of his team, or will his abrasive manner cause them to tune out? 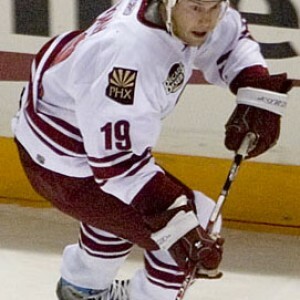 When Tippett took over the Coyotes prior to last season, he quickly went to work on re-making the squad. He instituted a more defensive approach to the team, and with the lack of true offensive superstars, he had to preach playing a solid two-way game that would keep the team’s goal differential in check. With a disciplinarian as a coach, teams will occasionally turn against them. The sports world is littered with examples of this, such as the Chicago Bulls turning against Scott Skiles and the San Francisco 49’ers haven’t exactly been keen on listening to Mike Singletary as of late. They both had short term success, but long term stability with the teams wasn’t something they were able to accomplish. When asked if the Coyotes would initiate a similar coup d’etat against Tippett, McWhorter was skeptical and endorsed Dave’s methods. With the team’s coach firmly in place, and with players who seem to be starting to really meld together, the Coyotes are looking to prove that last year was no fluke. If they can improve on their defense, continue their improvements on offense, and possibly add some pieces at the deadline, there is no reason to believe that Phoenix can’t contend in the rough and tumble Pacific Division.